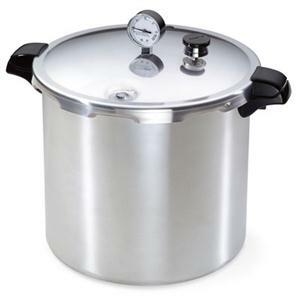 Presto 23-Quart Pressure Canner... Pressure canning is the only method recommended safe by the U.S.D.A. for low-acid foods such as vegetables, meats and fish. The easy-to-read gauge automatically registers a complete range of processing pressures. Air vent/cover lock allows pressure to build up only when the cover is closed properly and prevents the cover from opening until pressure is safely reduced. This Presto Pressure Canner also doubles as water bath canners for preserving fruits, jams, jellies, pickles and salsas. Mason Jar Capacity: 24 Half-Pints, 20 Pints, 7 Quarts. 23-Quart liquid capacity (21.8 liters) Constructed of extra-strong, warp-resistant aluminum and suitable for use on regular and smooth-top ranges. Includes cooking/canning rack and complete instruction and recipe book.